Sri Lanka Navy (Women) took on Sri Lanka Air Force (Women) in the women's final of the Defense Services Championships while Sri Lanka Army (Men) took on Sri Lanka Airforce (Men) in the men's final. Defending champions Sri Lanka Navy won the women's title while Sri Lanka Army emerged champions after quite a lapse in the men's division. It was a tight contest between the two forces as it went down to final bullet as Sri Lanka Airforce won the battle in the extra time period. Sri Lanka Airforce dominated the maiden quarter as they led the game by eleven points. 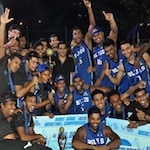 Sri Lanka Army only scored five points as Sadun added a couple of shots while Pawan Gamage swished in a free-throw. A couple of three pointers from Gavi Cooray and six points from Anthony Venito strengthened the Air-force power as they scored seventeen points for the quarter. It was the second quarter that fired up in style as Sri Lanka Army settled their nerves and executed their plans. Coming back to the game they added seventeen points during the quarter. It was Sriyantha Perera who top scored swishing six points off the ball. The Air-men scored two points extra and ended the quarter adding nineteen points. Anthony Venito kept on ticking the score board scoring another six points. The score board read 35-22 in favor of Sri Lanka Air-Force at lemons. Sri Lanka Army, turning the tables around, had a fabulous run of 16-06 in the third quarter which bought them back into the game. A couple of three pointers from Suraj Balasuriya and another from Kevin Vivekshan kept the Soldiers at attention. Sri Lanka Airforce completely lost the plot as the managed to add only six points. Coming into the final six-hundred seconds Sri Lanka Army scored twenty points while Sri Lanka Airforce added twelve points and tied the game at 58 all. Both sides were awarded five minutes of extra time where Sri Lanka Airforce added eleven points in reply to the four points of the Soldiers.